Our Fall Ficstitches Yarns Kit Club is featuring yarn dyed by Lynette Connors of Willamette Valley Wool Company. If her name sounds familiar, we worked with her on our second kit back in 2015. 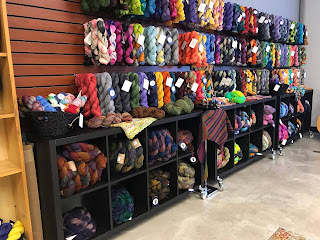 We don't often repeat dyers, but she recently rebranded her yarn company from Dragynknyts to Willamette Valley Wool Company, and has so many great new bases. C. Jane Reid and I had a blast at Lynette's Grand Opening just 2 weekends ago! You can read our original Dyers In Their Studios Profile of Lynette from 2 years ago HERE. But we asked her to give us an update on what she is doing now, and how she got there. 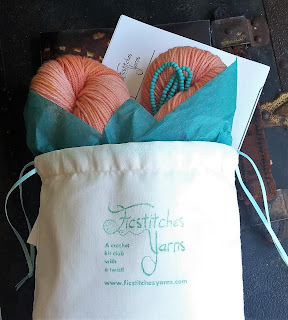 Remember tonight is your last chance to PREORDER your Fall Ficstitches Yarns Kit Club, before Midnight July 31st! 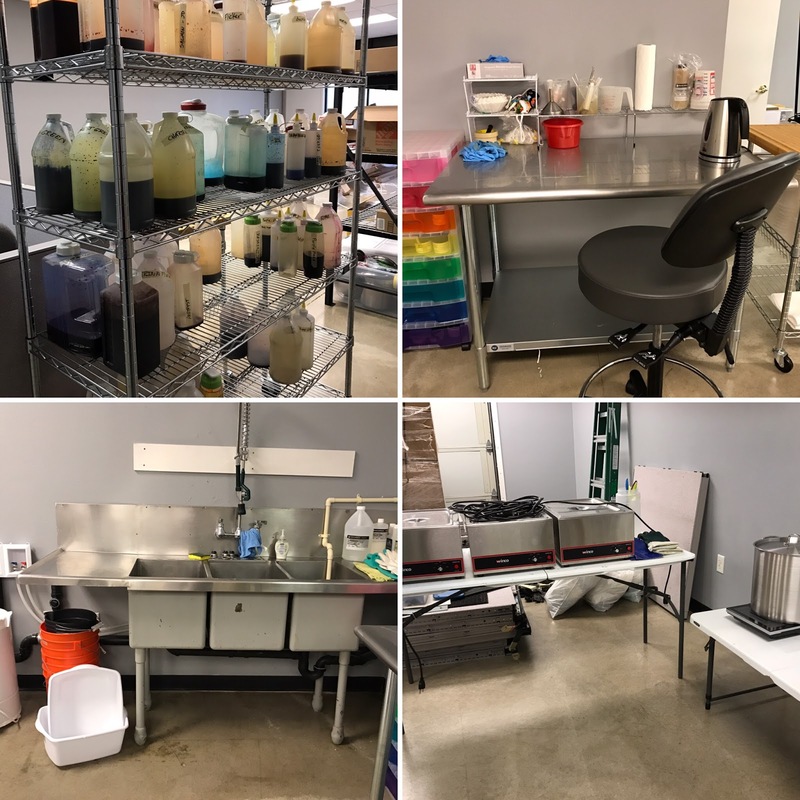 My little dye company has grown quite a lot since you posted my profile previously! My business name has changed to Willamette Valley Wool Company and I’m now working out of my own professional dye studio in Eugene, OR. 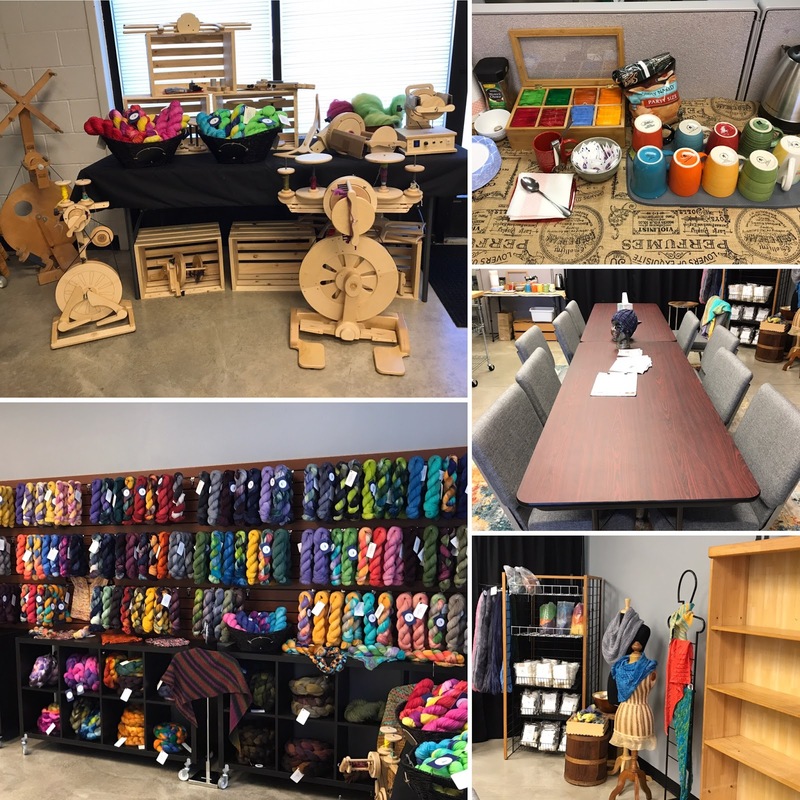 I have some retail space where I can sell and also host weekly social knitting and spinning times (Thursday evenings 5-8 and Saturdays 11-4). 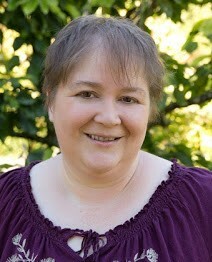 And I’m a member of the Indie Dyer Collaborative now, a group of professional indie dyers and really amazing people. This professional membership has been key in growing and expanding my business. I dabbled with dyeing as far back as 2009, with just powdered drink mix and cheap wool, but started seriously dyeing for myself with professional dyes in 2013 and began selling first fiber, and then yarn in 2014. At first, I had just four yarn bases and two fiber bases. I’ve grown my product line quite a lot since then. 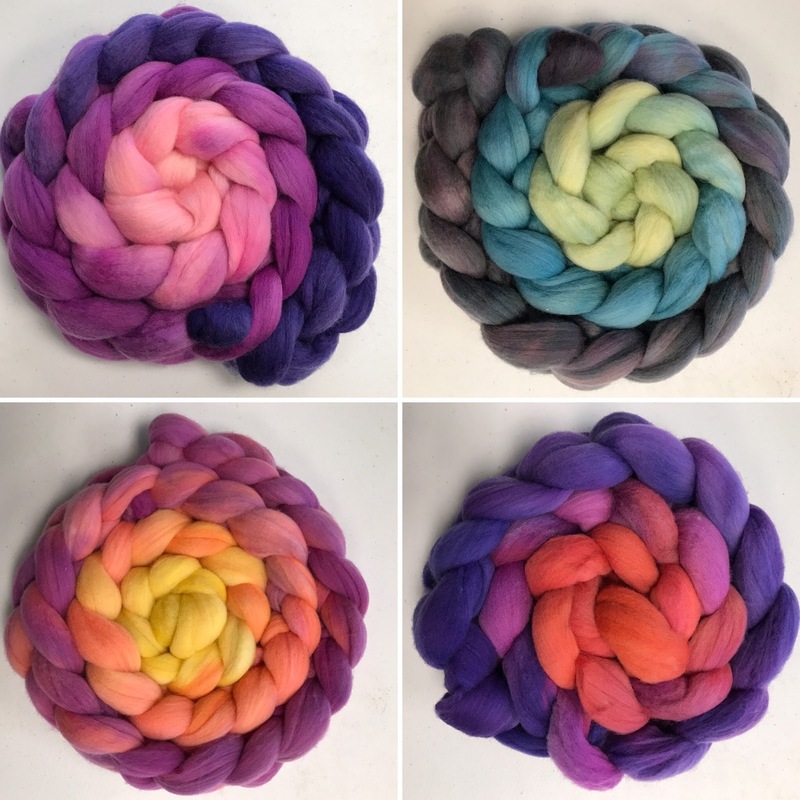 I now regularly carry 12 breed specific fibers (both hand dyed and undyed), and between 10 and 12 yarn bases, depending on the time of year, all high quality wools and blends. My dyed fiber braids are 8 oz, undyed are 4 oz, and I have sampler packs with all the breeds, and a learn to spindle kit with spindle and fiber. I also do 4 oz blended batts, and gradient batts, as well as 1.5 oz art batts. I’m in the process of adding to my product offerings with add-ins for spinning (silk noil, Angelina, etc. ), needle felting kits, some patterns, etc. 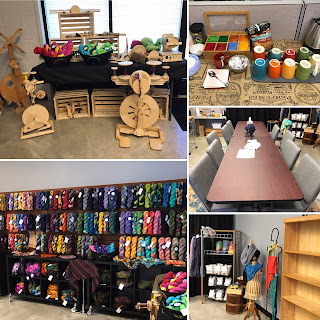 I’ve also become a Spinolution spinning wheel dealer and carry several other products in my shop from local makers including ceramic yarn bowls, ceramic buttons and shawl pins, moisturizer bars, wool wash, etc. I originally started dyeing because I wanted more unique colors for my own projects than what I was finding in commercial yarns. My budget didn’t allow for much indie dyed stuff back then, so I started making my own. When people wouldn’t stop asking me to dye for them, it turned into a business, and has grown tremendously since then. My background before dyeing was mostly as a stay at home mom homeschooling our kids. I did work part time in several yarn shops, sold some finished knitted goods, and did a little pattern designing. I’m unique because I offer so many different breeds, and I always dye 8 oz braids, which are twice the size of what most dyers are doing. I also try to bring in breed specific fibers with a variety of textures and avoid too many luxury blends. I’ve just made an effort to be sure I’m offering different things than other dyers in my region. I really believe there’s room for all of the wonderful dyers when we all have a niche and a style. Something non dyers might not know, I actually didn’t know until I had been dyeing for a while. I didn’t realize how many different ways dyers are dyeing. 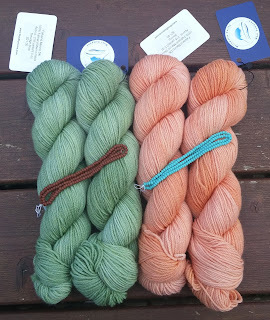 I learned two main methods, and I knew of a couple more, but now I know, there are nearly as many different ways to dye yarn as there are yarn dyers. There are very few hard and fast rules about how yarn can obtain a new permanent color on wool. Now, I have branched out and have been experimenting with several new to me techniques in addition to my tried and true, and it’s improving my overall skill set and the quality of my products. 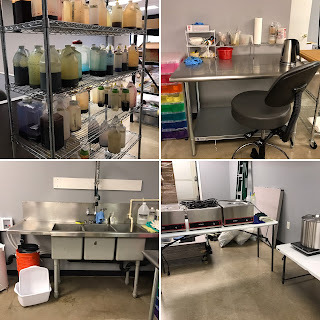 Non dyers also usually don’t understand how much labor goes into dyeing yarn, especially for specialty products or when a dyer reaches production levels. For me, this is a full time job now and I’m needing help to keep up. Inspiration: My favorite inspirations are from traveling and events. Things that I can experience personally. But I do also draw from photos sometimes, too, and I have quite a lot of Pinterest boards for this purpose. Colorways: For yarn: I have somewhere between 60 and 80 colorways, I stopped counting. For fiber: None right now, I do all my fiber one of a kind (or usually three or four of a kind, but not repeatable). However, I’m considering adding some regular colorways for gradient dyed braids soon. Special order colors: I do some special order colors for my wholesale customers. The website has a list of events, and at some point will also have an online shop. Facebook is the place to look for the most up to date information. Events, whether the shop might be closed, etc. Instagram gives you a peek into what I’m doing and working on day to day and will have the most up to date announcements. I have many, many inspiration boards on Pinterest to draw color inspiration from whenever I need some. Ravelry Group: http://www.ravelry.com/groups/wooldyelove-chat-n-share This group has been edited, it was formerly the DragynKnyts group but now that I’ve changed my business name, I’ve updated the group. 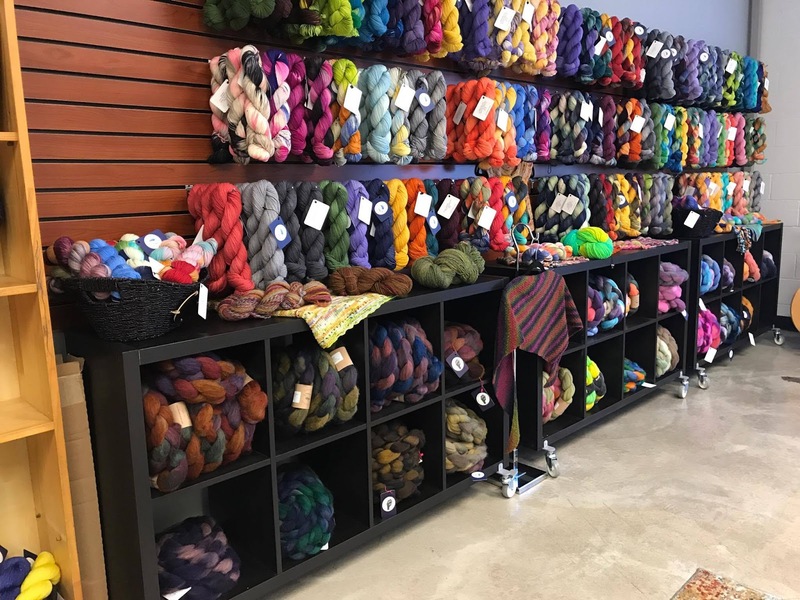 LYS: You can find my yarns and fibers in my own studio in Eugene, OR during open times, and at trunk shows in LYS’s and at fiber festivals around the Pacific Northwest and beyond. Thanks Lynette! And Thanks to Lynette's recommendations all THREE of those yarn shops she mentioned have invited me to teach there. Remember Today is the LAST DAY to PreOrder the Fall Ficstitches Yarns Kit Club featuring Lynette's Yarn, you can choose "Smudge Stick" or "Shrimp". Don't miss your chance!